We've noticed there is confusion surrounding load ratings and we understand! Every roof rack brand seems to have their own label for it and nobody really explains it. You may have seen it referred to as Loading Capacity, Load Rating, Max Load and more. We've created this guide to help clear up misconceptions, so you understand your vehicles limits in the most common circumstances. We will go through the different types of load ratings, how to calculate each and best practices for loading gear. This is important information to prevent damage to your racks, gear and vehicle. When mounting a load to your roof there are four main considerations to ensure it is safe and secure, these include; load rating, weight distribution, size of the load and installation. Static Load Rating -When the vehicle is stationary. On-Road Load Rating - Driving on sealed roads. Off-Road Load Rating - Driving on dirt, uneven or unsealed roads. 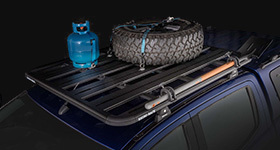 Cargo Rating – Amount of luggage or gear you can put on your racks and roof rack accessories. To avoid overloading your vehicle take the vehicle load rating and subtract the weight of the roof rack, any accessories and your load. This will tell you the cargo rating, the safe load to carry on your vehicle. 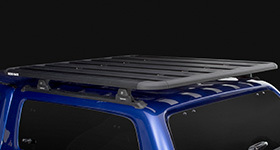 Be mindful that overloading your roof racks will void the warranty and may also void your vehicles warranty as well. All Rhino-Racks display the vehicles moving load rating for on-road driving, found through 'fit my car'. 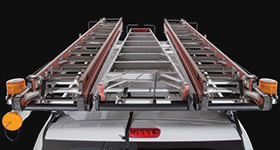 In some cases, such as vehicles with backbone systems, track mounts and roof rails, the load rating may change between roof rack systems. The higher load rating is due to greater reinforcement by the fitment style, for example the load rating may increase when factory rails are removed. The static rating can be much higher and should be found in your vehicles user manual or by contacting the vehicle manufacturer. For off-road use, there is a recommended safety factor, due to increased vibrations, rocking movement and other adverse conditions. The safety factor is 1.5 to 2 depending on the roof rack and fixture style, you can find the safety factor in the roof rack instructions. To calculate the off-road load rating, divide the load rating by the safety factor, then subtract the weight of the racks, this will tell you the safe off-road cargo rating for your vehicle. Make sure you factor in any additional brackets and accessories. Any load you are carrying should be evenly distributed over the racks where possible to minimise changes to the vehicles' steering and handling. Weight distribution should be even left to right and front to rear of the vehicle without exceeding the load rating or height, width and length restrictions (see large loads below for dimensions). Drivers must be aware that the weight distribution and size of a load can alter the vehicles handling. Make sure you drive with greater caution and know your vehicle may take longer to slow down. Long or protruding loads, extending forward or rear of the vehicle must be tied down front and rear to the vehicle and to the roof racks. This is especially important as wind directed under the load can place an upward force on the roof racks increasing the load on the roof and racks, this is especially important when driving at highway speeds. Long loads require a brightly colored flag fixed at the furthest points front and rear during the day and lights at night to help avoid collisions. Loads on top of a vehicle must be secured using appropriate straps and anchor points. If you are using a rack accessory like a bike or kayak carrier you must follow the instructions carefully and do a wiggle test before driving to check it is secure. It is up to the driver to ensure they are compliant with the state laws and have safely secured their cargo. Many countries and states have laws limiting large or protruding loads, you should be aware of your local laws and always check the regulations before travelling across borders. 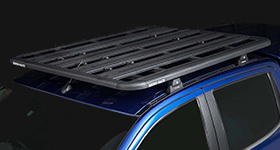 It is important that all roof racks and accessories are installed and attached correctly. Incorrect installment of racks may void the warranty and could result in an accident, serious injury or death to others. As always, the driver of the vehicle is responsible for securing the roof racks and accessories. 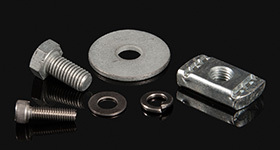 The attachments and bolts should be checked periodically (every 1,000kms) as well as doing a visual inspection of all components for wear and damage. Always follow the fitting instructions when installing roof rack systems, to ensure a secure and safe fit. If you have any questions regarding the racks or installation please contact the dealer or retailer from where you purchased your racks. 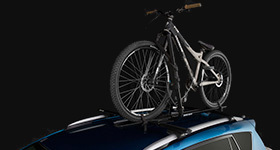 If your roof racks do not come with all the required tools to install or are unsure, we recommend you get them installed by an authorised dealer. You can find all our dealers information here. Are you sure you want to report this comment as abusive? Please note that comments will be moderated and removed if deemed inappropriate.